What could bring about more festive cheer than giving a gift of a HAND MADE, bespoke Christmas Wreath to your friends and family. 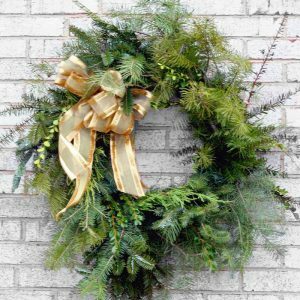 My hand crafted wreaths are made with a seasonal variety of foliage, possibly including, but not limited to, blue noble fir, lodgepole pine, scotts pine, yew, holly and ivy. A carefully selected mix of decorative elements are also in the mix, such as pine cones, berries, hips, dried fruit and flowers - many of which I have grown myself. 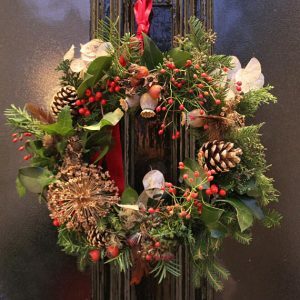 The Christmas Wreaths are designed for outdoor use but can also be displayed indoors if you wish however proximity to radiators or other heaters will, shorten its fresh appearance. Lifespan is approx 6 weeks.